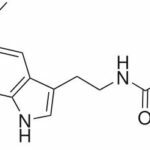 Melatonin (N-acetyl-5-methoxytryptamine) is a hormone primarily produced in the pineal gland. This gland is a pea-sized organ located in the center of your brain and shaped like a tiny pine cone (hence its name). Your pineal gland is filled with cells that respond to light and darkness. 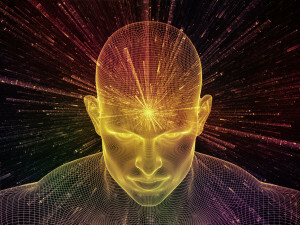 Many Eastern traditions refer to the pineal gland as the “third eye” for this reason. Your pineal gland acts as your body’s central clock through its secretion of melatonin. Telling your brain, body and organs when it’s time to be active and when it’s time to rest. This is the reason why melatonin is referred to as the “sleep hormone”. Melatonin is also a powerful antioxidant. It scavenges free radicals and reactive nitrogen species. It protects mitochondrial ATP synthesis. And melatonin is set apart from many other supplemental antioxidants because it easily crosses the blood-brain barrier. 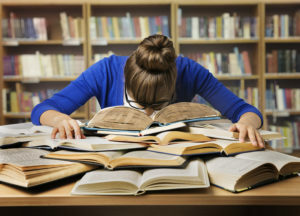 How does Melatonin work in the Brain? 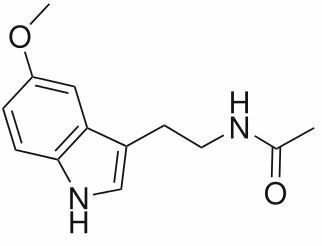 Melatonin (N-acetyl-5-methoxytryptamine) is a hormone produced in your pineal gland. Melatonin is often referred to as the “sleep hormone”. As your body’s central clock, melatonin tells your body, brain and organs when to be active and when to take a break and rest. Melatonin and the neurotransmitter serotonin are both derived from the amino acid L-tryptophan. 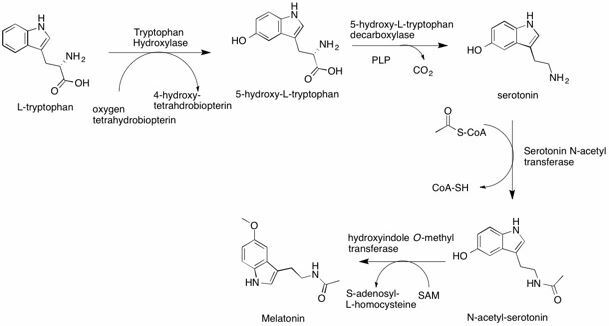 First L-tryptophan is hydroxylated by the enzyme tryptophan hydroxylase. The intermediate is decarboxylated by PLP and 5-hydroxy-L-tryptophan (5-HTP) to produce serotonin (5-HT or 5-hydroxytryptamine). This process is first fueled by the tryptophan you get from foods like turkey, chicken, tuna, oats, bananas, peanuts and chocolate. Or from a L-tryptophan supplement. You can also supplement with 5-HTP to produce serotonin which will create melatonin. Or supplement with SAMe to produce melatonin. Or you can take a melatonin supplement on its own and bypass this entire process. Besides acting as your body’s biological clock, melatonin is also a potent free-radical scavenger. And a wide-spectrum antioxidant. The beauty of melatonin as an antioxidant is its ability to easily cross the blood-brain barrier. 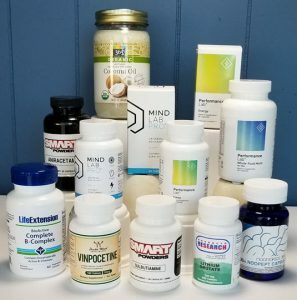 Adding melatonin to your nootropic stack gives you a head-start in protecting yourself against Alzheimer’s and Parkinson’s Disease, decreases your chance of stroke, and helps reverse the brain damage caused by stroke or brain injury. The bonus is a good night’s sleep and feeling refreshed the next day. With your brain firing on all cylinders. Melatonin helps brain health and function in several ways. But two in particular stand out. Another extensive survey of clinical trials was conducted by the U.S. Department of Health and Human Services on melatonin use for sleep disorders. Low levels of Melatonin are associated with a variety of health problems. Much more than just insomnia. Melatonin deficiency is one of the earliest indicators of Alzheimer’s Disease. [xvi] Abnormal oxidation and inflammatory protein accumulation can lead to Parkinson’s Disease. And is associated with low levels of melatonin in the brain. Low levels of melatonin lead to increased free radical production and risk of stroke goes up. And oxidative damage to brain cells is a leading culprit in traumatic brain injury. Melatonin is both a neurotransmitter and hormone. 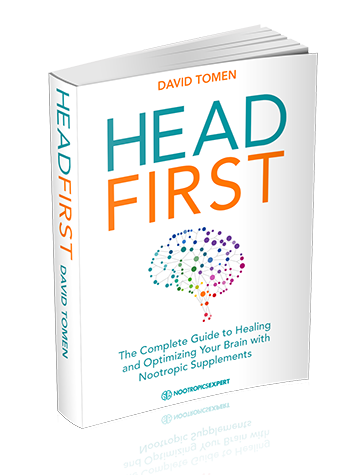 This ‘neurohormone’ is produced in your pineal gland from the neurotransmitter serotonin with the assistance of SAMe and other enzymes. Melatonin is the mechanism used by your pineal gland to function as your body’s biological “clock”. And is in charge of the “circadian rhythm” that tells your system when to be active, and when to rest. As a nootropic supplement and sleep aid, melatonin exerts its effects by acting as a ‘phase re-setter’ rather than as a hypnotic-type drug. Supplementing with inexpensive melatonin helps restore your body’s natural antioxidant protection. Guarding against age-related changes in your brain. Melatonin protects cholinergic neurons from the amyloid and tau protein buildups related to Alzheimer’s Disease. 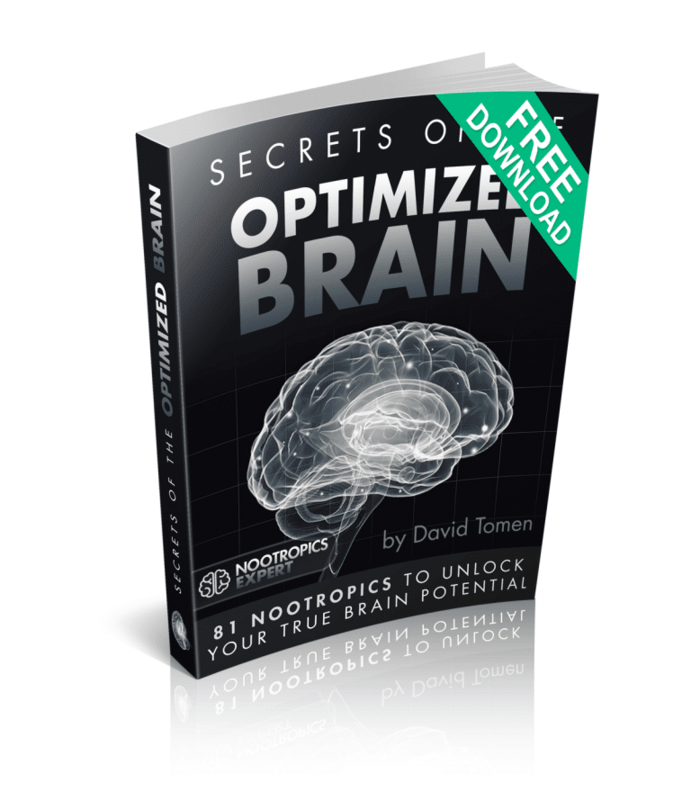 Melatonin offers potent antioxidant protection for your brain. Supplementing with melatonin helps protect your brain against neurodegenerative disease, reduces stroke risk and guards against brain trauma. I use melatonin every night to help me sleep. I open and empty 3 mg of a Now Foods 5 mg melatonin capsule in about 4 oz. of tart cherry juice. And take it 90 minutes before bedtime. Sleep comes on within 5 minutes of hitting the pillow. And I sleep through the night. But melatonin as a sleep aid has mixed reviews among neurohackers. And for good reason. Melatonin is a hormone that your body naturally produces from serotonin. Too much melatonin is not good. Some find that supplementing with melatonin works well, and others find it disrupts sleep patterns. If you are perfectly healthy and do not deal with insomnia on a regular basis you don’t need to supplement with melatonin. Everyone’s body chemistry is unique. Some find that ½ a mg of melatonin works well. And others require 5 mg. Experimentation is key with this hormone. Some have found that melatonin helps regulate disrupted circadian rhythms caused by jet lag or night shift work. Melatonin levels decrease as we age, and the possibility of heart disease increases. And studies in the last 10 years show that melatonin and your cardiovascular system are linked. Patients with cardiovascular disease have decreased melatonin levels. Studies also show that people with heart disease have high levels of LDL-cholesterol. Research has found that supplemental melatonin decreases cholesterol by 38%. And reduces LDL accumulation by 42%. Studies show that sleep disorders affect 50 – 70 million Americans, or about 20% of the population. A sleep disorder exists whenever a lower quality of sleep results in impaired functioning, or excessive sleepiness. Insomnia is the most common sleep disorder affecting 6 – 12% of the adult population. A double-blind placebo-controlled study in France worked with 244 adults with primary insomnia. Patients received prolonged-release melatonin nightly for up to 12 months of the trial, followed by a 2-week withdrawal period. Mild cognitive impairment (MCI) is often the final step before dementia. Approximately 12% of MCI patients convert to Alzheimer’s Disease or other dementia disorders every year. Researchers in Argentina took a look at the first and final assessment of 50 MCI patients, 25 of whom had received a daily dose of 3-9 mg of melatonin at bedtime for 9 – 18 months. Patients who took melatonin showed significantly better performance in the mini Mental State examination and the cognitive test used to assess Alzheimer’s. The team conducted several other tests and found better performance in every test but one. This study done in Argentine had subjects use fast release melatonin 3 – 9 mg daily for 3 years just before bedtime. And it significantly improved cognitive and emotional performance. Including the daily sleep-awake cycles of patients. A follow up study was done with 91 MCI patients. 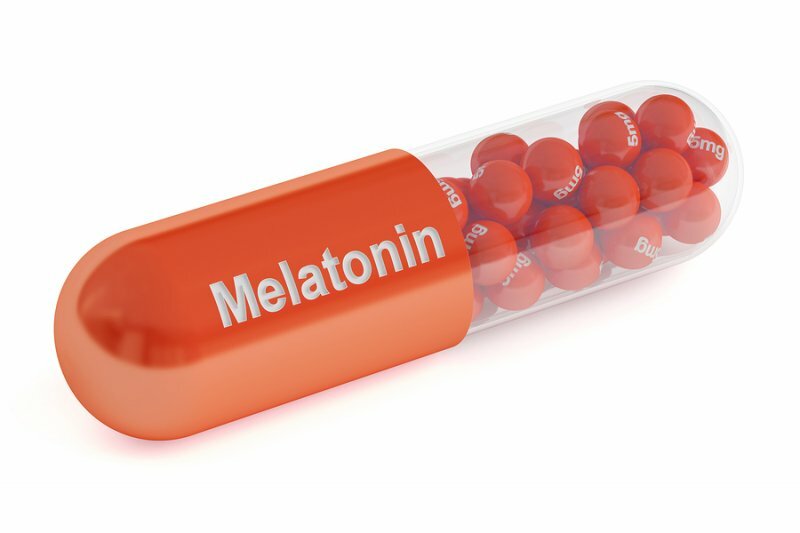 61 patients received 3 – 24 mg of fast release melatonin at bedtime for 15 to 60 months. Patients given melatonin showed significantly better cognitive performance and every other parameter tested. Our recommendation is if you are using one of these drugs for sleep, it would be wise to start using melatonin instead. And start weaning yourself off the benzos. Unlike all the other nootropics we talk about on Nootropics Expert, there is no recommended dosage for melatonin supplementation. Everyone has different responses to its effects. Lower doses like ½ mg of melatonin work well for some who are especially sensitive. And higher doses can cause anxiety and irritability. The best approach is to start with very low doses of melatonin (i.e. ½ mg) and see how your body reacts. The right dose should produce a restful night’s sleep with no irritability or fatigue the next day. For jet lag: ½ – 5 mg of melatonin an hour before bedtime at your final destination. Melatonin is considered very safe when taken in normal recommended low doses. Some may experience nightmares or vivid dreams when supplementing with melatonin. Melatonin can cause drowsiness if taken during the day. And if you experience a “sleep hangover” the next day, you took too much melatonin the night before. Other side effects include abdominal cramps, dizziness, headache, irritability, decreased libido, breast enlargement in men and reduced sperm count. Melatonin can interfere with fertility if you’re trying to get pregnant. Do not use melatonin while you’re pregnant. Melatonin can worsen symptoms of depression. So if you’re dealing with depression, or are using antidepressant medications you should avoid melatonin. Remember that melatonin is a hormone. So if you have hormone-related issues you must be careful about using melatonin. Melatonin may increase the risk of bleeding and should be avoided if you’re taking anticoagulant medications. Or are anticipating surgery. Melatonin can interfere with steroids and immunosuppressant medications and cause them to lose their effectiveness. Melatonin is available in capsules, tablets and liquid. Capsules and tablets usually range from 1 – 5 mg.
Melatonin 1 – 3 mg per day. We recommend using melatonin as a nootropic supplement. Your body does make melatonin on its own from serotonin in your brain. Most healthy people have an adequate supply of melatonin. But if you’re dealing with insomnia and need some extra help in getting to sleep and staying asleep, melatonin can help. Melatonin easily crosses the blood-brain barrier, and takes effect in about 90 minutes. Avoid taking melatonin immediately before bed because you may have trouble falling asleep. Melatonin is especially helpful to those dealing with jet lag or shift work that has you working nights. Disrupted natural circadian rhythms can be normalized by supplementing with melatonin. We suggest trying a melatonin supplement first at a dose of ½ – 1 mg taken 90 minutes before bedtime. And see how you feel. If you readily fall and stay asleep until morning you know you’ve got the dose right. Then adjust your dose up or down depending on how you react. 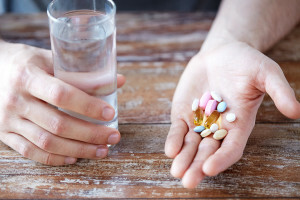 Most people don’t need more than 3 – 5 mg per night. Does melatonin lower testosterone levels? I read that melatonin should be cycled or else your body will slow down or even stop producing it’s own. Is this true? I have been taking 1mg-2mg every night for around 4 years now and I’m nervous to stop taking it. Is it safe to take for so long without a break? Thank you in advance..
Melissa, it really depends on what your body can take. Personally, I can’t even use pure melatonin but use Tart Cherry Juice and L-Tryptophan which are both precursors to melatonin. If you have been using it for that long and it’s working for you then I wouldn’t worry about it. Thank you Dave! It works good for me, so I’ll continue to take it. I’ll try adding what you suggested also. Thanks! I was following you on the natural melatonin from Tart Cherry from “Cherrypure” with LifeExtention. They did not provided a breakdown of the melatonin . = a 500mg capsule only has 12,5mcg melatonin. Do you know any who has a much higher concentration to at least reach 1,5mg of natural melatonin without consuming tons of Tart Cherry for that ? Wim, I do not and suggest your check the CherryPure manufacturer’s website to find out what types of extracts they offer. Great article. However, the recommended dosing seems to be a little high. I recently read two MIT studies (2005 http://news.mit.edu/2005/melatonin and 2001 http://news.mit.edu/2001/melatonin-1017) that found that 0.3mg was optimal and anything upwards of 3mg actually had a little to no effect after a few days.